On this page you’ll find a recipe for smoked sweet and sour tofu skewers – the perfect food for summer cookouts. 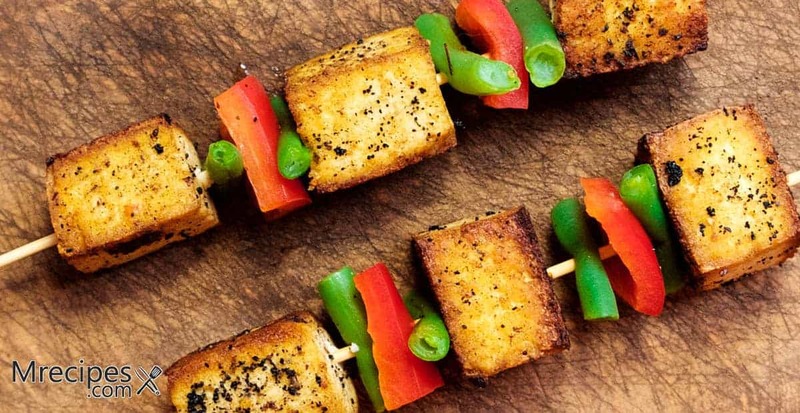 These tofu kabobs are simply irresistible. Other two skewer / kabob recipes on our site are Smoked & Marinated Chicken Skewers and Smoked Seasoned Shrimp Skewers. This recipe is is vegetarian, vegan, and gluten free. If you would like to have extra sweet and sour sauce for serving, double that part of the recipe. You can always store any leftover in a jar in the refrigerator for a few days to use later in the week on other dishes. Note: You may have leftover pineapple or asparagus after assembling skewers. These can easily be added to stir fry dishes. 1. Drain the water from the tofu package. Wrap the tofu block in either a clean dish towel or a lot of paper towels. Place this on a plate and press down lightly to release as much moisture as possible without breaking the block. Place the tofu on dry paper towels and allow it to drain some more while you make the sauce. 2. In a sauce pot, place the first 5 marinade ingredients and bring to a simmer over medium high heat, stirring often for about 2 to 3 minutes. Stir or whisk in the cornstarch slurry and scallions. Just heat through until the sauce just starts to thicken, about 1 to 2 minutes. Remove from the heat and set aside to cool. 3. Cut the block of tofu into equal 1” cubes. You should get about 32 to 36 cubes. In a covered container, place 1/2 the marinade. Add the tofu cubes and lightly toss just to coat them without breaking the tofu. Place the covered container in the refrigerator for 30 minutes or up to 4 hours. 4. Cut the pineapple into 1” cubes, if not already prepared for you. Remove the woody ends of the asparagus spears and cut into 1” segments. Set these aside while you prepare the smoker. 5. Remove 1 or 2 racks from the smoker to place the skewers on. Prepare your smoker by adding wood chips to the tray and water to the bowl. Preheat the smoker to 250°F. Open the top vent. 6. Arrange your skewers: Place a pineapple cube toward the end leaving 1 inch of skewer showing, then an asparagus section speared through the middle, followed by a tofu cube and another asparagus piece. Repeat until the skewers are filled, leaving an inch of space at each end. Put the skewers on a plate and brush on 1/2 of the remaining marinade. 7. Spray the smoker racks with vegetable oil to lightly coat. Place the skewers on the racks. Put the racks inside the smoker. Smoke for approximately 45 minutes. Rotate the skewers 180 degrees and brush the rest of the sauce over them. Smoke for another 15 minutes or until the asparagus feels tender *. Sprinkle sesame seeds over the skewers and serve them over white rice or just with napkins to eat casually. Add extra sauce if you have some. * This may take a little trial and error, depending on how fresh the asparagus is. Early spring asparagus is so tender it can be eaten raw. Older and sometimes hot house asparagus can be a little tough. You could do an extra skewer that has just a few pieces of asparagus as a tester. Note. There are two types of skewers. Reusable steel skewers and bamboo wood skewers. Bamboo wood skewers can just be thrown away after smoking. However, it is always recommended that you soak wood skewers in water for at least 30 minutes before placing over any kind of flame. While an electric smoker doesn’t have a direct flame, there is still so much heat that you should do do some soaking. If you’re really into skewers, you might also like our Smoked & Marinated Chicken Skewers and Smoked Seasoned Shrimp Skewers / Kabobs.